It looked like a quick and easy buck - let her car be used in a fake accident and submit dodgy medical claims, but it soon went sour and left Belle (not her real name) on the hook as part of a motor insurance scam. The temptation of easy money resulted in 10 months' jail for cheating and giving false information, and Belle, a nurse in her 40s, also lost a job she had for 20 years. Such scams are rife despite the police's Commercial Affairs Department (CAD) taking a hard-line approach. According to one estimate, around 20 per cent of all motor insurance claims are dodgy. There were 26 reports of such cases lodged in the first nine months of this year compared with just 13 for the whole of last year. Most reported cases are linked to large-scale syndicates, said Superintendent Abdul Rani Abdul Sani, head of the CAD's Insurance and Specialised Fraud Branch. They tend to be reported by insurers or discovered in the course of related investigations, added Supt Abdul Rani, who leads the 12-member unit. 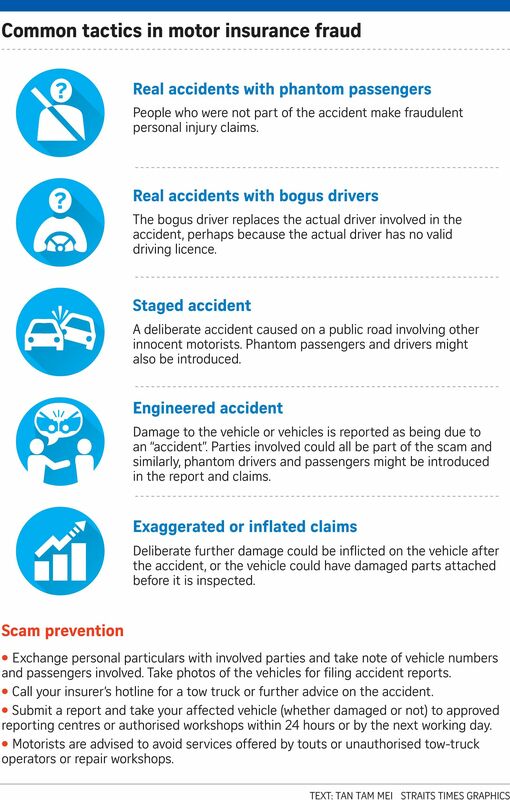 Investigations typically involve CAD officers uncovering layers of operations, at times involving over 100 people who play different roles such as recruiters, vehicle suppliers, stunt drivers and phantom passengers. First nine months this year. These syndicates usually recruit by word of mouth or through chance encounters, said Deputy Superintendent Johnny Sim, officer-in-charge of the team. "We've seen cases of people recruiting family or friends into the syndicate." The team has taken down at least five major syndicates over the past five to six years. One of the recent busts resulted in a former dispatch rider being jailed for six years and two months in March last year, after he helped to stage 21 car accidents in a bid to make more than $1.1 million in fraudulent insurance claims. The 37-year-old was one of the masterminds of the syndicate, which had at least 29 people and cheated 16 insurers. Efforts by the CAD and insurers to clamp down on motor insurance fraud have also led to increased prosecutions, with 66 last year, up from 60 in 2015 and 48 in 2014. Fraud remains prevalent and "unfortunately" results in insurers having to bear losses which affect motorists through higher premiums, said General Insurance Association (GIA) chief executive Ho Kai Weng. Mr Ho noted: "Consumers could end up paying higher public transportation fares if additional costs are not totally absorbed by public transport providers." Conservative estimates suggest that about 20 per cent of all incurred motor insurance claims are inflated and fraudulent, said the GIA. However, the total figure for incurred motor insurance claims has declined over the years, with $494.3 million in claims last year. That would put the estimate for fraudulent or inflated claims at $99 million. In 2015, such claims hit $540.1 million in value - with an estimated $108 million from fraudulent or inflated claims. In 2014, the figure was $591.2 million, with dodgy claims worth about $118 million. The decrease is due in part to the GIA Fraud Management System introduced in January this year. This employs data analytics to improve fraud handling processes. "While we are in the early stages of the system, results are starting to show," said Mr Ho. Tell-tale signs of fraud that insurers look out for include multi-vehicle staged collisions, gross exaggeration of injuries and unusually large claims for simple accidents. The GIA Motor Claims Framework , implemented by all motor insurers, also helps to reduce the likelihood of fraud by ensuring clear standards and prompt reporting of accidents within 24 hours. Insurers have also started special investigation units to investigate claims in greater detail and pursue follow-up action, added Mr Ho.